Ants may affect us adversely by stinging or biting; invading and contaminating food; nesting in lawns, golf courses, or within premises; stealing seeds from seed beds or feeding on germinating seeds; defoliating or gnawing into plants and plant product. Killing young poultry , birds, livestock, or game; simply annoying humans and animals with their presence; and possibly transmitting certain human diseases after crawling over sputum, feces, carrion, and so forth. Some carpenter ants can cause serious structural damage to wooden structures. However, only a small number of all the ant species are damaging or medically significant due to their stinging behavior, and require control because of these factors. Because of the wide variations in feeding and other habits of different ant species, their successful management often requires exact identification of the species involved. 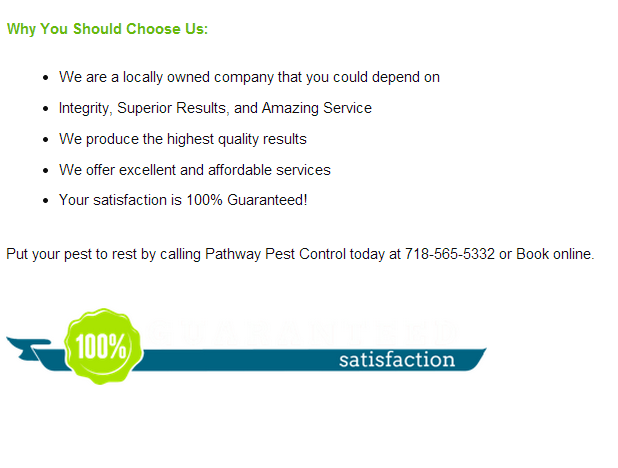 This knowledge allows the professional to gain accurate information. 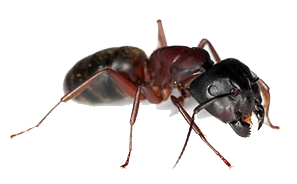 Carpenter ants are among the most conspicuous of ants found in and around homes, being large and typically blackish or very dark bodied. Foraging workers have rather large mandibles which they can bite or give a strong pinch. Carpenter ants will establish nest in a number of different locations. Outdoor sites include stumps, hollow logs, telephone poles, fence posts, or other similar large pieces of wood. Wood that is moist or partially decayed is preferred by many species, especially in the northeastern United States; however, cracks, crevices, and other cavities may be used to start a nest in sound wood. Ants may be carried into homes in firewood or enter and establish colonies via other routes. Often ants move into a building solely to feed. Carpenter ants excavate nest galleries in wood. These galleries somewhat resemble the work of termites but can be distinguished by their entirely clean and almost sandpapered appearance they are frequently hollowed in moist or unsound wood although carpenter ants can burrow in sound wood. Carpenter ants do not use wood for food. 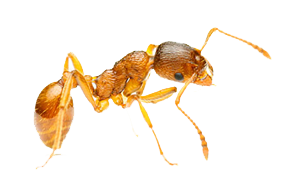 Pharaoh ants are light yellowish to reddish-brown in color. They are found in localized regions throughout most of the United States and part of southern Canada. They have become a common pest in many areas. They are an important ant pest in homes, apartments, hotels, grocery stores, restaurant, hospitals, nursing homes, and other facilities throughout much of their range. their small size which enables them to get into almost anything, and their very wide food preferences combine to make pharaoh ants difficult to eliminate from structure in many cases. seems inappropriate. However, substances like syrups, fruit juice, honey, jelly, cakes, pies, greases, dead insects, or meats and blood are frequently fed on. In hospital they will often feed on blood and other bodily fluids, medical waste, or intravenous feeding fluids. Occasionally, when a particularly good food resource is found, especially close to the nest, some queens can be seen traveling to and from the food location. Typically, however, the queens remain in the nest and are not seen or importantly, cannot be controlled without use of and effective bait that the foragers must bring back to the nest and feed to the queens. species of ant involved, the extent and nature of the infestation, and location of the nest or nests used by the infesting species.